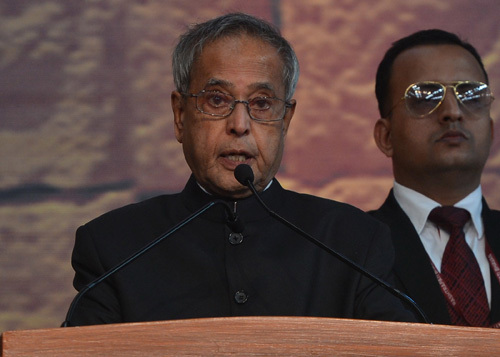 SPEECH BY THE PRESIDENT OF INDIA, SHRI PRANAB MUKHERJEE AT THE INAUGURATION OF THE 10TH WORLD ZOROASTRAIN CONGRESS ON THE THEME "ZOROASTRIANISM IN THE 21ST CENTURY: NURTURING GROWTH AND AFFIRMING IDENTITY"
I am delighted to be here this evening to inaugurate this Conference. I note that this is a landmark meeting – not only because of its important theme, but especially because it is being hosted in Mumbai after a gap of 23 years. As I look at the distinguished gathering here today, I am reminded that Mumbai is home to the largest and most vibrant community of Zoroastrians in the world. And it is with happiness that I reiterate the well known fact that whether it is in the world of business and industry, or art and letters, leading our defence forces or breaking new frontiers in the field of advanced science and technology, the Zoroastrian community in India has always extended itself and reached the highest echelons of achievement and success. While other foreign colonists never failed to systematically exploit India’s rich resources and its people, the Parsis, as we named the first immigrants as they came from Persia, while retaining their identity and culture, have uniquely merged, over the centuries, into India's social, cultural and political fabric. They have contributed, with distinction and competence, to India’s development and accomplishments in every sphere of human activity. Ladies and Gentlemen, the strength of Zoroastrianism lies in its underlying philosophy that humankind is designed to evolve toward perfection through a "good conscience” cultivated through good thoughts, words, and good deeds. The "Cyrus Cylinder” is considered to be the first declaration of human rights and Zoroastrianism urges both genders to equally share responsibilities. So it is no wonder that when the first Zoroastrian settlers arrived in India in the 8th Century, just as their beliefs found resonance in our own philosophy of Hindu dharma, the Zoroastrians themselves gained the acceptance of our people. Their succeeding generations have not only "sweetened” our society, but they have enriched it and become a part of its very fabric. In the early days of our struggle for freedom, so many national leaders of the Zoroastrian faith came forth and led the charge against colonialism. In 1907, at the International Socialist Conference in Stuttgart, Madame Bhikaiji Cama fearlessly unfurled what she called the "Flag of Indian Independence". Dadabhai Naoroji , the first Asian to be elected to the House of Commons of the United Kingdom , was one of the first to publicly demand independence for India. He believed, and I quote, "Whether I am a Hindu, a Mohammedan, a Parsi, a Christian, or of any other creed, I am above all an Indian. Our country is India; our nationality is Indian". We are all aware of the significant contribution of Dr. Homi Bhabha, the first Chairman of our Atomic Energy Commission, we recall with great respect Dr. Homi Sethna under whose leadership India developed her indigenous civil nuclear energy programme, and JRD Tata, who founded India's first commercial airline. It is surely a matter of pride for the Zoroastrian community that they gave India several distinguished military officers. Field Marshall Sam Manekshaw was not only the hero of the 1971 war, but also the hearts of the soldiers who he led from the front. I would like to mention Admiral Jal Cursetji who became Chief of the Naval Staff, Air Marshal Aspy Engineer who served as the 2nd Chief of Air Staff in post independence India and more recently Air Marshall Fali H. Major. In Mumbai, it is acknowledged that it was the Parsi community that laid the foundations of industry and the commercial and financial infrastructure that characterise this vibrant city. Great luminaries come to mind – and I pay homage to their dedication to nation building. Jamsetji Tata was instrumental in ushering in industrialisation – that changed the course of Indian history. With a noble philosophy that wealth should be used for advancing society, Parsi business houses have been at the forefront of building institutions of science, medicine and culture and they have also led our corporate sector in philanthropy and initiatives for social development. Mahatma Gandhi recognized this when he declared that the Zoroastrian community in India was "unequalled and unsurpassed” in charity and philanthropy. A few days ago, one of the premier television channels, while celebrating its silver jubilee, decided to honour 25 Indians who are living legends due to their unparalleled achievements in their respective fields. It is significant, but not surprising, that three of these 25 greatest Indians identified on that occasion belong to the Parsi community – Shri Ratan Tata, Shri Fali Nariman and Shri Zubin Mehta. This is all the more commendable when we consider the small numbers of this community. Yet why is it that today the community has come to a crossroads where it feels threatened with extinction? Zoroastrianism, which was once the religion of millions in pre-Islamic Persia, now has less than 140,000 followers world-wide, and 1/3rd of this number is aged over 60. This is certainly a phenomenon that needs to be addressed - very pragmatically and sensitively. Government of India, in its 12th Five year Plan envisages several measures to protect and promote the interests of minorities – including those of the Zoroastrian community in India. The Jiyo Parsi programme is bound to achieve desired results. I note that UNESCO has taken some initiatives – such as the "PARZOR Project” for "Preservation of Parsi Zoroastrian Heritage”; in 2010, the United Nation’s General Assembly supported by India and other States , has recognised March 21 as the International Day of Nowroz. It has called upon all States to honour this festival’s significance by promoting peace and goodwill. It is helpful that Nowroz has been officially registered in the UNESCO list as an "Intangible Cultural Heritage of Humanity”. While the demographic statistics indicate that the Zoroastrian community in India is declining by about 10% every decade, I nevertheless remain optimistic that this trend can be arrested. I have no doubt that a community that has such high literacy, talent, and discipline is bound to continue on the path of advancement and growth. I understand that in your meetings over the next days you will reflect on the challenges facing the Zoroastrian community the world over and discuss its future. I am certain that this will result in good initiatives that will ensure that this respected community grows in its numbers and continues to flourish and contribute to the progress of human civilization. With these few words, I wish the World Zoroastrian Congress every success. I take this opportunity to convey to this Congress, and through you, to the members of the Zoroastrian community in India and abroad, my best wishes for your progress and prosperity in the years to come.